The Zombie Diet. Show your bravado every time you reach for that worm and dirt sandwich you keep in your Zombie Head Lunch Box! The tin lunch box measures 7 3/4-inches wide x 6 3/4-inches tall x 4 1/4-inches long, so if you're thinking of bringing a sludge shake to wash those worms down with you're in luck. 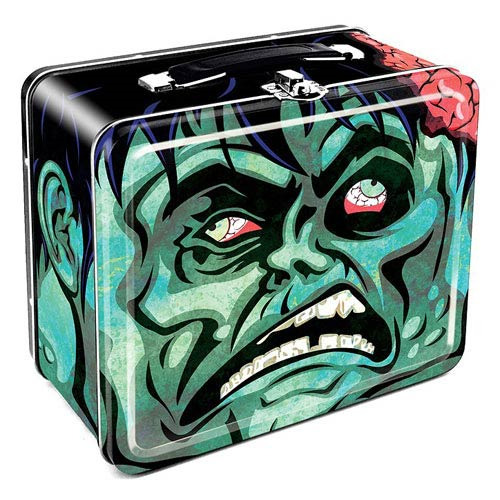 Featuring an obviously bloodthirsty zombie whose brain looks like mush, the Zombie Head Large Fun Box Tin Tote is sure to whet your appetite in the morning! Ages 14 and up.